Special Assistant to Former President, Goodluck Jonathan, Reno Omokri just came for President Buhari in new Facebook post. seeing peace return to the Niger Delta. We are seeing action to stop the killings of Christians in Southern Kaduna. We are seeing the Naira appreciate. We are seeing inflation rolling back. We are in no hurry for these positive developments to end. 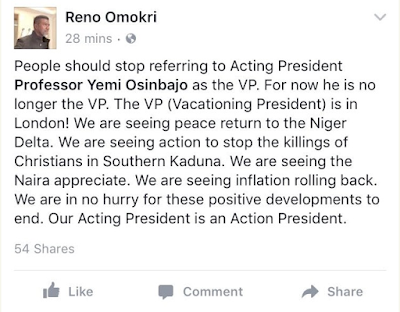 Our Acting President is an Action President.